The area of Jackson Hole is made up of cavernous mountains, flowing streams, and some of the best ski resorts and national landmarks in Wyoming. 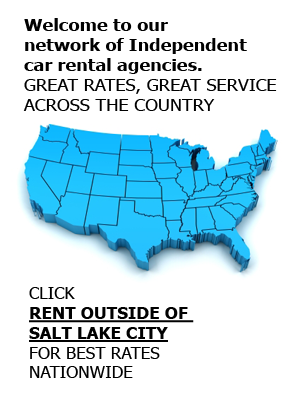 Although we do not have a location in Jackson Hole, our Salt Lake City offices are always here to assist you in locating a rental vehicle for your journey there. At Affordable Rent-A-Car And Sales, we make it possible for all of our customers to venture out into the area and embrace every second of their trip. We offer car rentals from our Salt Lake City locations, meaning customers have immediate access to both SLC and the surrounding areas, including Yellowstone, Park City, Moab, and Jackson Hole, WY. If you’d like to learn more about any of our services, contact us at (801) 266-7368, or submit an online reservation for a van, truck, SUV, or car rental. Pack your ski and snow gear for a vacation to remember. Discover Jackson Hole and the many ski resorts and snowy getaways with your family, friends, or by yourself. Each year, the area sees foot after foot of powdery snow, making it a prime destination for skiing and other mountainous sports. Most resorts also rent out snow equipment, host festivals and concert events, and have a number of great dining and shopping areas. If you’re looking for an adventure, Jackson Hole is the place to go. Just a few miles north of Jackson’s lively center is the Grand Teton National Forest and Preserve, home of pristine alpine terrain and remarkable mountain ranges. Plan your trip around the campgrounds there, and enjoy hiking, cycling, fishing, and relaxing by your RV rental. If you enjoy tent camping, ask us about one of our SUV rentals or trucks, so you can bring all the necessities for a successful camping trip. As a family-owned company that prides itself on customer service and professionalism, Affordable Rent-A-Car offers one of the area’s largest selections of rental vehicles. From cars to van rentals and SUVs to truck rentals, we can cater to any of our customers’ needs. If you’re traveling from Utah into the Jackson Hole, Wyoming area and need a reliable form of transportation, contact our rental office at (801) 266-7368 today, and ask how we can help. We also help production companies with their transportation needs, as well as offer airport rentals to those flying into the SLC International Airport.